Reich, like many others, begins with the recognition that something seems to be different about capitalism in the last 20 or 30 years. He considers many of the aspects that are usually mentioned: the growth of big corporations, or their multinational nature, the globalization of both production and consumption – but quickly points to data that undercut these changes as causes of change in capitalism: either they simply are not true (e.g., there have been monopolistic companies in the past) or the changes in capitalism pre-date their supposed cause. Reich develops the term “supercapitalism” to describe the hyper-competititve nature of markets, the constant search for a “good deal” and the impact these have had on the behavior – and options for behavior – open to corporations. Comparing the present with what he calls the “Not Quite Golden Age” of 1945-1975, he demonstrates that competition was important – but not the only goal of corporations. 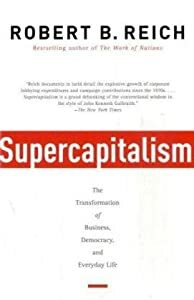 Supercapitalism highlights the contrast between the things Americans want from businesses under three headings: as investors, as consumers, and as citizens. As investors, we want high profits; as consumers, we want low prices. These demands work together: companies have to squeeze every miligram of productivity out of workers, cut costs in every way possible, and maximize sales by producing the most irresistible products, and marketing them mercilessly. As citizens, we want workers to have a living wage and adequate benefits. We want environmentally-conscious production. We bemoan the avalanche of high fat junk food and raunchy movies, and the ads for them that target the young. In the Not Quite Golden Age, competition was moderated by other forces – but under supercapitalism, it is not, and cannot be. Reich points to the many campaigns to get one company (often Wal-Mart) to change its practices, or the scandals over high salaries and bonuses in one firm or segment. To the extent that they succeed, they make one firm or segment less competitive – or else are met only to the extent that they can be done in cost-efficient ways. While the changes are usually celebrated as conversions of heart, often the companies back away from them once the heat is off – sometimes before they are ever implemented. If it’s possible to make a decent product at a lower price by ignoring those environmental / labor /etc. social norms, some firm will step in to do it – and people will buy the less costly product, no matter their moral stance. (StarKist found that even if dolphin-safe tuna cost only 1 cent more per can and was clearly marked, most consumers would not pay the extra penny: they would choose the dolphin-killer tuna instead). Reich’s analysis points to an imbalance between the responsiveness of corporations to our desires as consumers and investors, on the one hand, and as citizens on the other. After demonstrating the many reasons why market mechanisms no longer provide the leverage for re-balancing the citizen demands, he points to legislation as the way those desires should be expressed – and runs headlong into the massive involvement of corporations in financing political campaigns. The corporations themselves would just as soon NOT have to spend billions on lobbying efforts – but no one can afford to stop so long as all their competitors are still involved. I found the analysis quite interesting, solidly grounded in history – and making good use of data. I’m less convinced by the prescription – it might well be what would work, but I have a hard time seeing how we could get there. I harbor hopes that social norms and pressure, exerted more effectively, might divert the heavy-hand of government regulations wherever possible. Reich takes on a complex topic and offers an insightful and unique analysis that goes beyond what is commonly reported in the media. Well worth the time to read – or listen to.